The newest fragrance from the House of BOSS, BOSS Pure, is inspired by the idea of man becoming one with water. It's an energizing scent that bursts with aquatic freshness and captures the sensuality and emotion of the pure, unstoppable power of water. The power of BOSS Pure is found in the fizzy Mediterranean citrus. Blended with juicy fruit notes and water accord, the character of the fragrance is fully captured—subtle, sophisticated, and utterly fresh. 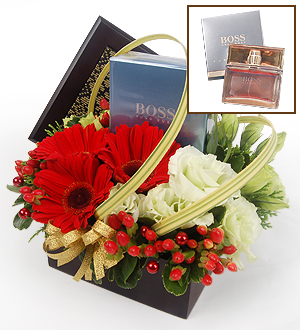 This contemporary fragrance comes beautifully packed with Gerberas and Eustomas.